Some of the best value, longest lasting, most efficient lighting available for 12 volt applications is LED Spotlights. Standard UK home wiring is prepared for 240V AC mains electricity. If you want to have 12V lighting in your home, shed, workshop, cabin, boat, or caravan etc, then you will need to string up some new dedicated 12V wiring. You can have the spotlights powered through an inefficient 240VAC to 12V DC adapter or set up a PV solar panel or wind turbine to charge a 12V battery to power the bulbs. NEW Details on using MR16 LED Spotlights for Shed and Garage Lighting are available here. LED spotlights are available in a range of different sizes, however by far and away the most common sizes are 35mm diameter and 50mm diameter – known in the trade as MR11 and MR16 respectively (for 12 volt applications). If you already have 12V halogen spotlights fitted in your home they are almost certainly either MR11’s or MR16’s. 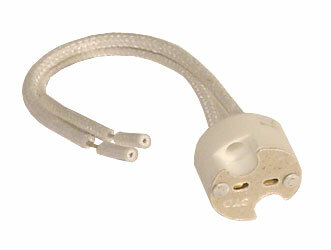 It is perfectly possible to simply crocodile clip, solder, or wrap wires around the positive and negative terminals of a 12V MR16 or MR11 spotlight bulb, however you should really purchase some dedicated 12 Volt Spotlight Connectors. They only cost around £1 each and are massively over engineered for use with LED bulbs since they are designed to cope with the extreme hot temperatures (250+ degrees C) from 50 Watt halogen spotlight bulbs – far more power and heat than with a typical LED spotlight bulb. You simply wire the connector into your 12V circuit and plug your bulb into the connector socket. 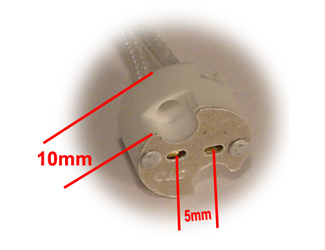 MR11 and MR16 bulbs both fit into the same connector since the terminal pins are 5mm apart on both sizes of bulb. 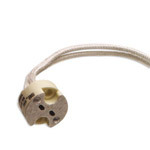 Two holes are drilled through the connector through which you can screw the connector into position on your ceiling, wall or wherever. The bulb holder pictured above is now available in the REUK Shop:MR16 Ceramic Bulb Holder, as are compatible 12V LED spotlights.